This year sees British microphone manufacturers Sontronics celebrate their 10th anniversary. During those years, their product range has expanded to cater for a wide variety of applications, and the company have developed a reputation for delivering quality and performance at a sensible price. 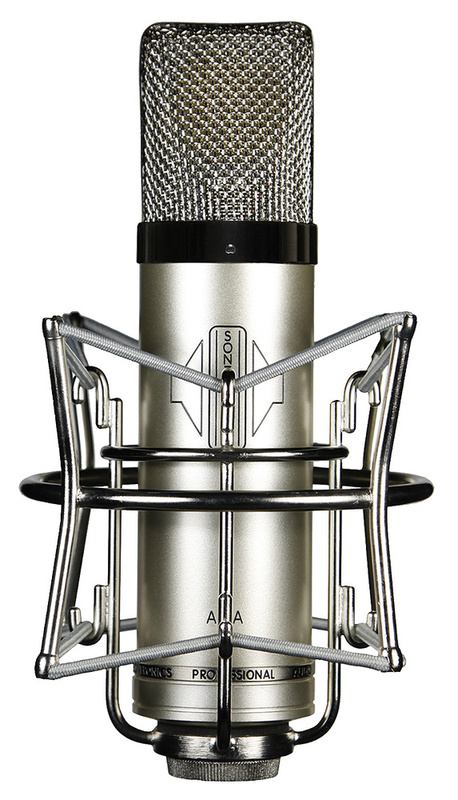 Their most recent addition, the Aria, is a large-diaphragm cardioid valve condenser, designed specifically with recording vocals in mind, and this latest offering is the our subject here. The Aria features a custom 1.07-inch edge-terminated capsule, premium-quality components in its circuitry and a JJ Electronic’s ECC83S (12AX7) valve. It ships in a generously proportioned aluminium case, with foam recesses for the various components of the system — the power supply, shockmount, cables, paperwork and the mic itself, which sits in a velvet-lined wooden box. This box also contains a simple ring mount for times when you might prefer not to use the supplied shockmount. The SPS-2 power supply features a -10dB pad and a 75Hz high-pass filter. There’s a tube-ready light, and what Sontronics describe as a “medical-grade electricity filter”. Specifications are available on the Sontronics web site, and I’m not going to list them all here. Suffice to say that the Aria is the sort of size and weight that you’d expect, and figures for noise, distortion, impedance and sensitivity are typical for this sort of microphone. I will say that the frequency response graph is remarkably flat, with a very subtle dip around 2kHz, an equally subtle lift between 5 and 10 kHz, and a gentle roll-off in the high frequencies, starting at around 15kHz. In reality, graphs don’t mean all that much, but that high-frequency roll-off is worth a mention for reasons that will become clear later. As you’d expect from a glance at the Sontronics price list, they manufacture in China, with the exception of the Slovakian JJ valve, and assembly takes place in the UK. They have worked hard over the years to cultivate a strong relationship with their Shanghai colleagues, and the dividends of that investment are clear to see here, and across their product range. Closer inspection of the hardware reveals some encouraging choices. The case is nice, but it’s not a full flightcase. It offers the sort of protection that you’d want in the back of your car, rather than on the baggage carousel. The wooden box is solid, better than the one with the rubbish, falling-off hinges that Neumann seem to persist with, but it’s not French-polished hardwood. The catch is cheap but functional, and the velvet lining is nothing to write home about. The shockmount, while simple and effective, has a bit of a ‘mass-production’ look about the metalwork — the machining is not of the same standard that you’d expect from the most expensive German or American products. And this is encouraging, because the microphone itself is excellent in these respects. It looks and feels expensive. It’s simple, solid and beautifully finished. Internally it’s spotless. The SPS-2 power supply is equally confidence-inspiring, and the cable robust. This is a product that retails at under £900 including VAT$1199, and when compromises need to be made to remain affordable, we want them to be in the accessories rather than the microphone or power supply. Sontronics have struck the balance between making these things decent and functional, without taking them from the artisan pile. Checking the price of a Neumann shockmount, I’m glad that sort of figure isn’t being added here for something that offers no performance advantage. Equally, if I decide that I need to take an Aria up the Amazon in a canoe, I can get myself a Pelicase. Many users will never take their mic anywhere, let alone into a hostile environment, like an airport terminal or a jungle, and Sontronics aren’t charging you more for the ability to do so. Your money is spent on the bits you want it to be spent on. It’s worth talking a bit about this high-frequency roll-off. The human ear and brain conspire to process what we hear in day-to-day life, reducing background noise and focusing on a certain frequency range. A microphone doesn’t perform all the same tricks — we’re all aware of the phenomenon of sitting in an apparently quiet space, and then opening a mic channel through a pair of headphones, and hearing all sorts of background noise and frequency extremes that we weren’t aware of in the room. But some microphones, like most ribbons, and some classic vintage examples that don’t have the same frequency response they would have left the factory with, have a presentation that more closely resembles our brain’s ‘point of focus’. By recording or reproducing audio in this way, we tend to get a result that we perceive as being more ‘natural’. Some analogue recording and playback mediums contribute further to this, with a gentle reduction of high frequencies. In the context of a digital recording, especially at higher sample rates, using modern condenser microphones with an extended frequency response, it’s easy to end up with a result that’s slightly unnatural in this respect — it could be very impressive, but there’s a risk that the result will be somehow ‘uncomfortable’. It’s also easy to capture ugly high-frequency content originating either at the source, or from less than ideal electronics somewhere in the signal path. To my mind this is one reason why ribbons remain more popular than ever, despite their practical limitations — they’re a great match for the digital medium. Sontronics incorporate this approach into all their designs, but it’s of particular relevance to a vocal microphone, because the more familiar the listener is with a particular source, the more they notice if it isn’t presented in a natural way. Of all the things we record, the human voice is perhaps the most susceptible to this. So this is going to be a balancing act in a number of ways. There’s the balance of price and performance, and of the restrictions of a single-pattern vocal specialist versus something more flexible. And there’s the balance between a natural, familiar sound, devoid of distracting extremes, and the sort of larger-than-life detail that many of us will expect in a modern vocal sound. So do the scales of microphone justice hang level? I used the Aria on a variety of vocalists, male and female, both in my own room and in ‘cost-no-object’ studio environments. 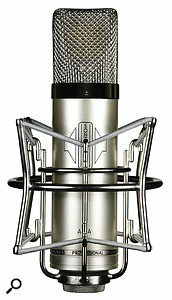 I was able to compare it to great examples of the most sought-after vintage microphones. So was it as good? Almost as good? Well, in some cases it was better. In more than one situation where I had the choice of almost any microphone, I picked the Aria. It sounds right — it delivers a big, clear, open sound. It’s detailed and airy, but never excessively sibilant. It maintains that natural quality that Trevor Coley has strived to achieve. We’ve talked a lot about high-frequency roll-off, and if you haven’t heard the microphone you could be forgiven for thinking that it might be slightly dark. It isn’t. It’s actually brighter than, for example, most U67’s — flatter through the upper mid-range and slightly more extended at the top; it doesn’t emphasise the mid-range in the way that many will associate with Neumann. The frequency response graph shows the roll-off beginning at around 15kHz, and that makes sense when you listen to the mic. The airiness in a vocal is lower than that, and it never feels as if the mic is band-limiting the voice, rather just gently reducing anything up above it. This aspect of the design is really very well-judged — it would be easy to get it slightly wrong. At the other end of the frequency spectrum there’s a solid sense of low end, without boominess. There’s proximity effect in evidence, available when desired, but not excessive or problematic. This is a good, good vocal mic. Every microphone will suit some voices more than others but it’s testament to the even mid-range response that it has worked well for all the voices I’ve tried it on. In this application it genuinely holds its own in A-list company. It’s not a copy, and it doesn’t sound the same as any other particular model. But if you stick it up alongside a U67, a U47 and a C12, you’re not going to feel ashamed of it. It won’t win every shootout on every voice — nothing does — but it can comfortably show its grille alongside the best, and you can’t say that for many, if any, other mics at this price. In fact you can’t say that for many mics at any price. Trevor Coley believes that this is because extended frequency response is not an asset in this application and, listening to this, it’s hard to argue. The use of an edge-terminated capsule in this microphone may suggest, to some, an AKG-esque leaning — but I don’t think it’s that easy a conclusion. Sure, it’s a bright and detailed sound, with a flat mid-range response, but I think it’s a stretch to relate the capsule design to the sonic character too much. It would be equally rash to assume that all centre-terminated designs exhibit the sort of mid-range emphasis associated with Neumann. It’s more about the interaction of the package as a whole, than any one component. Trying the Aria on other sources, its attributes translated in a predictable way. On tambourine it was fantastically smooth, with no peakiness or confusion in what can be a fairly peaky and confusing top end. Typically I choose a modern ribbon, like a Royer SF24, for sources of that sort of character, where I’m looking to control some of the really high harmonics, and to avoid introducing ugly high-frequency resonances that might clutter the result. The Aria did a superb job on this very revealing source. Similarly, acoustic guitar sounded big, full and bright, but with a smooth and uncluttered treble. I also liked it as a mono overhead on a drum kit. I didn’t get a chance to try it on strings, but I did consult a cellist, Peter Gregson, who I knew owned one, and he had used it on a variety of Hollywood movies and TV shows, on his Spitfire Audio sample library, and on his new album, Touch. He couldn’t speak more highly of it, telling me that he and Michael Price had conducted an extensive shootout in which the Aria had won all rounds. They bought a pair, and kept one each. Peter now uses his exclusively, so I think we can safely say that it works very well on cello! I am unable to publish my own audio files of the vocal recordings I’ve made with the Aria during the review period, but it can be heard on the lead vocals of Foxes’ current single, ‘Better Love’. In designing a valve microphone, a manufacturer needs to trade off how much harmonic colour the circuit imparts against the headroom available before obvious distortion starts to creep in. It’s the subtle distortion that helps to provide life and size, but as with all products of this type there’s a point at which transients become noticeably rounded off, sometimes even squared off. There’s always a risk of this sort of thing when using most condenser microphones as overheads with a very loud drummer — for example, there’s a limit to what the U87 and U67 can take in that application before the clarity of the snare drum begins to disappear. The Aria is similar in its gain structure — it’s vulnerable to distortion at very high SPLs and, just like the two Neumanns mentioned above, it wouldn’t be my first choice up close on a screaming vocalist. This is not a criticism — this sort of mic would just be the wrong tool for that job. Add a Shure SM7 to the bag and you’re ready for anyone. This product comes at the right time. Budgets are not what they were, the back-end deal isn’t worth much, and the price of a high-end vintage microphone from the usual suspects has never been steeper. Most producers, even those at the sharp end of the industry, just don’t have the best part of $£10,000 burning a hole in their pocket. They’re looking for products that deliver without taking out their earnings for the quarter, and the Aria is truly one such option. When a company bubbles away for a number of years, producing quality products, they start to develop a reputation. But it can take a single outstanding product to move them up the ladder in terms of how their brand is perceived within the industry. I think the Aria might well represent that sort of cornerstone in the evolution of Sontronics. In terms of alternatives, it’s very hard to pinpoint particular comparable models. I think I’d say that, as with all vocal microphones, alternatives exist from a wide variety of manufacturers, including Brauner, Manley, Peluso, Microtech Gefell and Telefunken. The sound versus the cost. The sound versus the competition. The Aria sets a new benchmark for sound quality versus cost. It would not be out of place in any mic locker.